Part of this amazing recipe is from my lovely American friend Mel (of Mel’s Mac Daddy Salad fame), it also combines my Gorgeous Guacamole recipe that I’ve been making since I fell in love with Avocados when I was at high school! 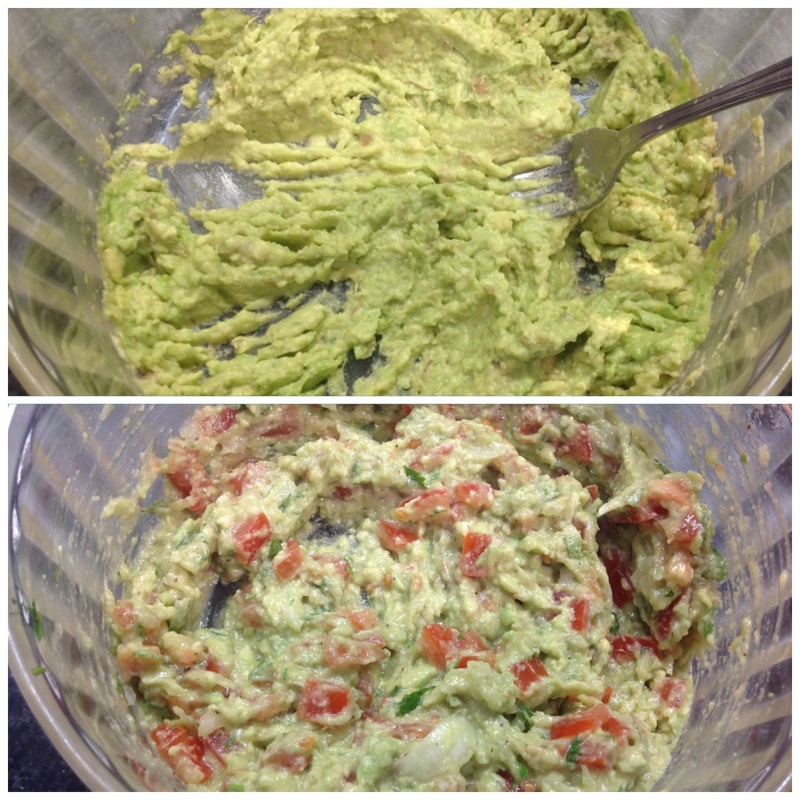 My Gorgeous Guacamole combined with Mel’s recipe, well, it’s simply the best dip I’ve ever had. 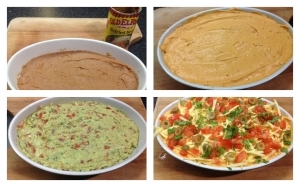 I love taking this dip to parties, like I did on the weekend (to a Mexican Party, how appropriate!) along with a big bag of cheese Doritos (because they are the best corn chips ever). 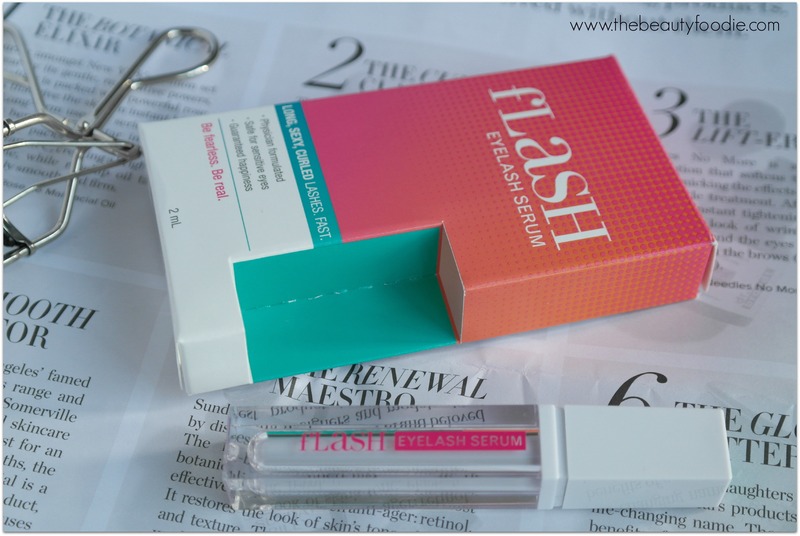 It’s a dip with serious Wow Factor and guys, in particular, enjoy this and can’t get enough of it. Thanks for sharing your recipes Mel. Got anymore? Step 1: Make the guacamole. Peel and mash the avocado. Add garlic, lemon juice, onion, tomatoes, coriander and olive oil. Mix to combine. Season with salt and pepper and Tabasco sauce to taste. Set aside. Step 2: In a bowl combine the taco seasoning, sour cream and mayonnaise. Mix well. Step 3: Assembly time. 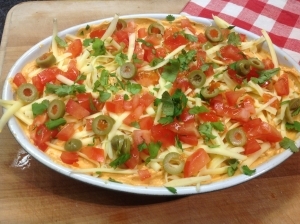 Take a medium sized bowl/serving dish (ideally a glass one, so you can see the lovely layers) and spread the refried beans on the base of the bowl. Smooth the beans down with the back of a spoon. Step 4: Add the guacamole and spread this on top of the refried beans. Spread this out evenly, being careful not to disturb the beans underneath. Step 5: Plop your taco seasoning/sour cream mix on top of the beans. 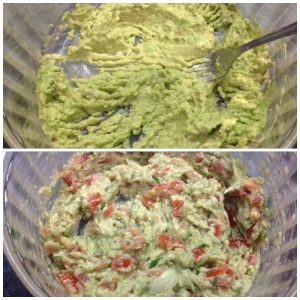 Spread this out evenly, again, being careful not to disturb the guacamole layer underneath. Step 6: Garnish time! 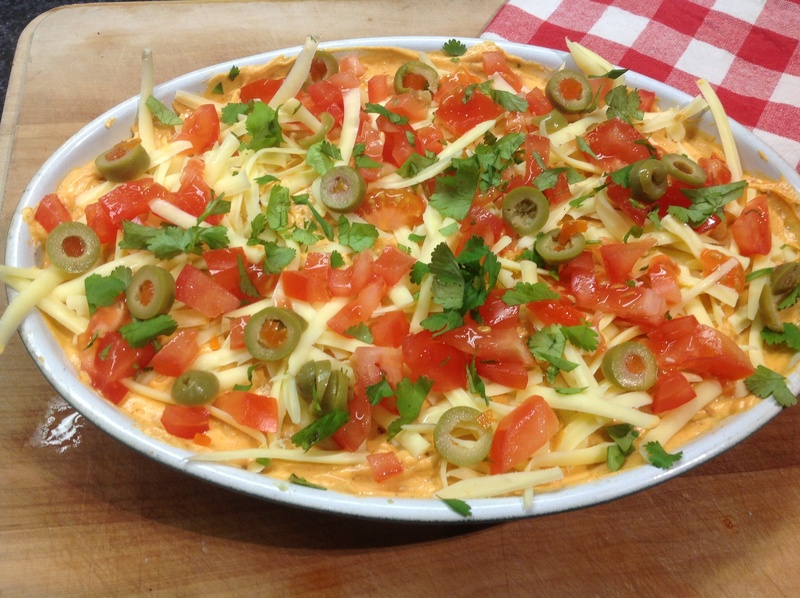 Spread grated cheese over the top layer of the tip. Scatter over over chopped tomato, olives and chopped coriander.